Elm Grove clinched the Bossier Parish middle school girls basketball seventh- and eighth-grade district titles Monday with victories over Cope at Cope. Both Elm Grove teams improved to 9-0 in district play. The district season concludes Thursday. In other games, Rusheon swept Haughton and Benton swept Greenacres. At Cope, Mikaylah Williams continued her outstanding middle school career with 26 points for Elm Grove’s victorious eighth-grade team. Annie Russell added eight. Williams and the Lady Eagles are 19-0 over the last two seasons. Chloe Larry, who is also having a great season, tossed in 15 points to lead the Elm Grove seventh-grade squad. Jayla James also contributed to the victory with her scoring. At Rusheon, Tylissa Henderson poured in 17 points in the Lady Rams’ 33-23 eighth-grade victory over the Lady Bucs. Adreonia Smallwood scored nine points. Nijeh Grant added five. Traniece Johnson paced Haughton with eight points. Daleese Wilson and Macey Schut combined for nine. 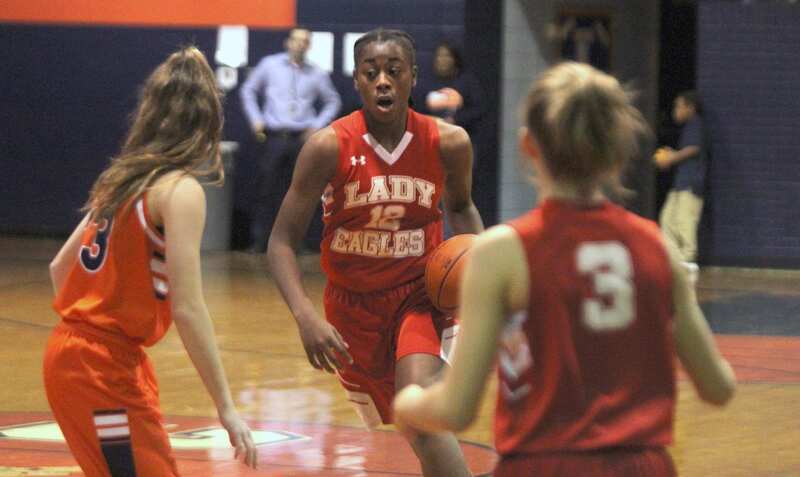 Rikyah Taylor led Rusheon’s seventh-grade team to the victory with 18 points. ShaCoreiya Williams also reached double figures with 11 points. Zanyah Lefear added eight and Miracle Smith five. Briana James led Haughton with five points. Benton had balanced scoring in its 24-17 eighth-grade victory over Greenacres. Tate Sellers scored six. Lauren Hall and Marissa Schoth had four each. Sellers led the Lady Tigers in rebounding. Schoth was also cited for her defensive effort. Danielle Colemon contributed to the victory with her all-around play. Katie Kent hit three 3-pointers and led Greenacres with nine points. Brelee Nichols, Kennedy Williams and Reese Ashley combined for all of Benton’s points in the Lady Tigers’ hard-fought 12-9 seventh-grade victory. Williams, who had an outstanding all-around game, and Emma Hollingsworth led the team in rebounding. Nichols was a defensive standout. Paige Marshall and Erin Harrell scored for Greenacres.